It's been pretty rainy and gloomy these past couple of days here in Utah so I put together a warmer rainy day look. Of course it just so happened to be perfectly sunny when Rachel and I took these. ;) Anyway, I love that rainy summer days don't require too much bundling up. A simple sweatshirt does the trick and allows you to still wear more light weight pieces like this chiffon maxi skirt from Chic Wish. 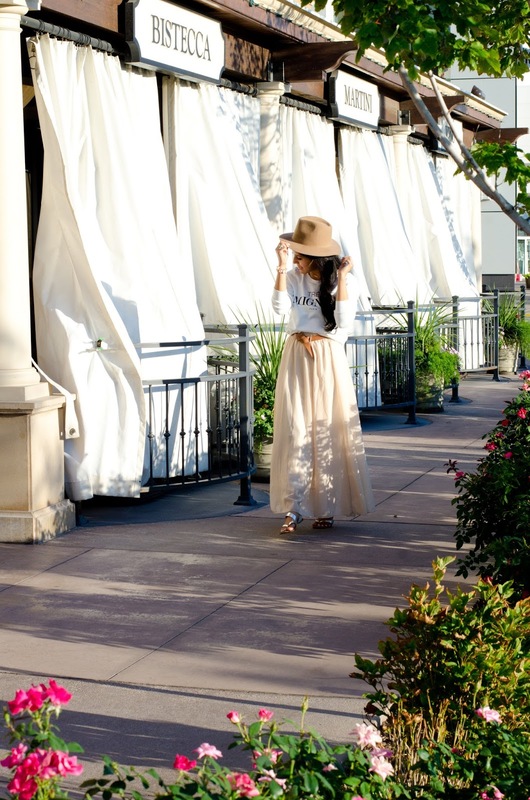 Which, you guys, this maxi skirt is DIvine! I know I'm always telling you all that Chic Wish is da best, but seriously, they are. I mean, it's soooooo floaty and dreamy! I've already worn it about a hundred times. Also, I love the look of monochromatic looks and this outfit was alllllll about different shades of cream. Well, stay tuned for some more Chic Wish looks I'll have for you all this week! I loveeeee the flow of that dress. & how you paired the belt and sweatshirt! You go girl!